Thwack! The solid thump startles me and I run to the window to see a poor hapless dove struggling to become airborne again. This happens occasionally, now that I have installed new windows and doors in part of the house. Seeing their reflection in the sparkling panes of glass, the birds must think there is either an enemy bird in the vicinity or an attractive mate winging inbound. It’s definitely not that morsel of al dente, microwaved macaroni and cheese sitting on my table that is tempting them. Before What a difference new doors and windows make. Gone are the old lattice panes – a nightmare for the window cleaner – and in are the energy efficient, double-pane slider doors. 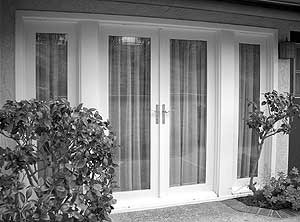 Banished are the heavy, cumbersome patio doors that served as resistance training without the gym, replaced by smooth operating, flick-of-the-finger sliding glass panels. Making the decision to replace old, drafty, noisy windows that leak at the slightest sign of a rainy drizzle, is one of those improvements that gets shunted to the bottom of the repairs list. We think we can get by for another year when all the while we could be enjoying more light in our homes and cutting down on heating bills. After all, we spend a lot of time in our houses so why not live in comfort? Look at those beautiful windows in brand new homes and imagine them in your house. Pretty nice, eh? Comparing the services of several companies and window brokers (surely, that isn’t the past tense of window breakers, is it?) the range of products, materials, styles, colors and installation schedule needs to be considered carefully. Oh, yes. Money definitely comes into play somewhere along the line. Knowing that this improvement will add value to your home it seems foolish to neglect a prime point of maintenance. Start by considering the merits of styles appropriate for the design of your house. Do you want to keep the sliders to the patio or change to French doors that open outward? Would you like to add a bay window? Perhaps you’d like to stay with the grid, but this time, it will be on the inside of the glass panes. When Joey Halaby, Vice-President of Sales at family owned Coastline Remodeling came to give his presentation, he came armed with samples to show the rugged durability of the sashes and doors. The weather resistant materials are impervious to the effects of pollution, salt, air and rain. He pointed out that the thick vinyl walls and door panels provide superior support and “fusion-welding” bonds each part together into a single unitized frame. Held together by internal metal reinforcement these air and watertight components resist the effects of driving wind and rain. The brilliant white color is part of each extrusion and not “painted” on after production. Our doors and sliding screen would have to be custom-made as they are not a standard size. One of the biggest selling points of using vinyl is the advantage of the track, jamb and threshold being easier to clean while the corrosive-resistant track aids in the smooth operation of the sliding panels. Twin tandem steel roller cartridges glide smoothly and can be adjusted for maximum ease of operation. After Choosing from a wide array of options, one of our choices was a TRADITIONS premium patio door. This style gave us an open view to the outside and provided a focal point to the room. The two glass panels on either side of the door offered extra light and being double-glazed, more energy efficient. Deciding to stick with the standard hardware we passed over the optional polished or antique brass handles although the sleek chrome and satin stainless steel gave us a moment’s indecision. Coastline Remodeling draws on its 50-years of experience and takes pride in the fact that they offer a 3-year labor warranty compared to many of their competitors who cover only 6 months to 1-year. The product line has a lifetime guarantee and is unique in the fact that it covers non-yellowing and fogging between the panes. Also, as Atrium Windows is part of General Electric they are able to extend an enticing financing package for those who qualify. Once our decision was made and the initial deposit taken, a second appointment was made to re-measure the sizes to avoid any mistakes. There is something to be said for the “measure twice, cut once” rule. On the day of installation the crew quickly dismantled the existing doors, expertly removing the glass and frames with little mess. Other companies we’d talked to did not remove the frames or perform custom trimming. Prior to starting the job they carefully laid covers on the floor to protect the carpet and furniture. It took just one day to complete the job with a short return visit the next day to explain the security locking mechanisms. At that point, our final payment was due. Coastline Remodeling can be reached at 714/751-9146.